The clamor of indigenous peoples for recognition of their ancestral lands resounded among the delegates of 195 countries at the climate summit taking place in the Peruvian capital. “I want my land…that’s where I live and eat, and it’s where my saintly grandparents lie,” Diana Ríos shouted with rage. 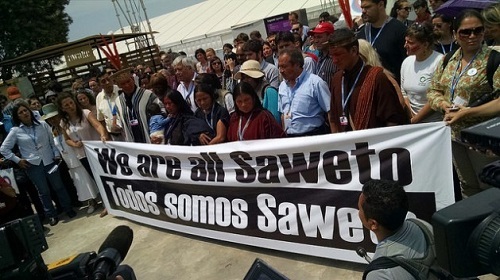 (IPS) – The clamor of indigenous peoples for recognition of their ancestral lands resounded among the delegates of 195 countries at the climate summit taking place in the Peruvian capital. 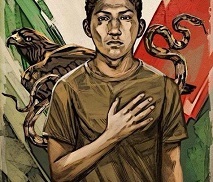 “I want my land…that’s where I live and eat, and it’s where my saintly grandparents lie,” Diana Ríos shouted with rage. The 21-year-old Asháninka woman is the daughter of Jorge Ríos, an indigenous leader who was killed in September for defending the forests of his community, Alto Tamaya Saweto, in Peru’s Ucayali jungle region. 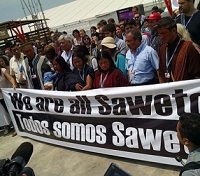 The families blame his death and the murders of three other native leaders in that area on illegal loggers, and protested Friday at COP20 – the 20th session of the Conference of the Parties to the United Nations Framework Convention on Climate Change (UNFCCC) – to demand formal title to their land. The main demand set forth by indigenous activists at COP20 is focused on gaining recognition of their land ownership, and with that the protection of their forests and respect for their ancestral knowledge and collective rights. In the eight countries that share South America’s Amazon jungle, formal collective title is lacking on nearly 100 million hectares of native land, according to the Coordinator of Indigenous Organisations of the Amazon Basin (COICA). In Peru, where the widows from the community of Alto Tamaya Saweto came from, there are still 633 native communities without title to their land, according to the non-governmental Instituto del Bien Común (Institute for the Common Good). The demand for land titles is linked to the implementation of the U.N. Reducing Emissions from Deforestation and Forest Degradation (REDD) projects and programmes in developing countries. In the agreements adopted at COP16, held in Cancun, Mexico in 2010, safeguards were included to avoid social and environmental damage to indigenous territories where REDD projects are being carried out. In the current 12-day conference in Lima, indigenous organisations are demanding that the states parties include, in the reports on safeguards that they have to present to the UNFCCC, indicators on biodiversity, the health of native peoples, land titling, and ancestral knowledge, among other aspects, Grace Balawag of the Kankanaey people of the Philippines told IPS. These indicators and others will make it possible to gauge the extent of the participation by native peoples in the mitigation of global warming, said Balawag, the assistant project coordinator of the Indigenous Peoples, Climate Change and Forests Project Partnership under Tebtebba, the Indigenous Peoples’ International Centre for Policy Research and Education..
Balawag and other native activists called for indigenous peoples to be included in national forest monitoring systems, because they have proven to be capable of preserving their land, thanks to their ancestral knowledge. The Alliance, which has been taking part in international conferences on climate change since 2009, includes 17 indigenous organisations from 13 countries of Africa, Latin America and Asia, whose territories are facing a variety of threats. In some cases, indigenous communities are suffering the impact of extractive activities like mining and oil production, Tarcila Rivera, the spokeswoman for the Continental Network of Indigenous Women of the Americas, told IPS. In others, indigenous people have had to fight illegal activities that jeopardise the way of life of local populations, said Rivera, who is also the president of the Centre for Indigenous Peoples’ Cultures of Peru (Chirapaq). A study by the Munden Project that analysed 73,000 concessions for mining, logging, oil and gas drilling, and large-scale agriculture in eight tropical forested countries found that more than 93 percent of these developments were found to involve land inhabited by indigenous peoples and local communities. The countries considered in the study, which was commissioned by the Rights and Resources Initiative (RRI) and published in October, were Brazil, Cambodia, Colombia, Indonesia, Liberia, Mozambique, Peru and the Philippines. These threats are linked to the number of murders of people fighting for the protection of the environment and their land. Between 2002 and 2013, 908 activists were killed around the world, according to the report Deadly Environment released this year by Global Witness. Brazil was the country with the most killings (448), followed by Honduras (109) and the Philippines (67). Although recognition of indigenous territories is a global demand, different methods and strategies are used, said Balawag. In some countries, like Peru, native peoples are asking for collective land titles, in nations like the Philippines they are demanding the demarcation of recognised ancestral land, and in other cases like Bangladesh they are pressing for the enforcement of agreements signed with governments in territorial disputes. “If the land is not entitled, if REDD is implemented, how can we receive the benefits? It is related to the benefits and to our own survival. We can even be evicted by our governments and corporations,” said Mrinal Tripura with the Maleya Foundation of Bangladesh. Tripura told IPS that the government of his country did not recognise the traditional system of indigenous peoples, who do not feel represented in the COP20 talks in Lima. Similar complaints came from Africa. “[We] indigenous peoples are the owners of the land. However, the State has not respected the traditional way in which we have managed it. Thus, land rights are the only strategy which we have left in order for our territories to be respected,” Maasai activist Stanley Kimaren Riamit, executive director of Indigenous Livelihoods Enhancement Partners (ILEPA), told IPS. “Carbon investors are interested that ownership of the territories is clearly stated prior to investing in REDD. Trees grow on land, and that land belongs to someone,” said the Kenyan activist. This reasoning sounds simple but is an awkward truth for many countries taking part in the COP20 negotiations, which are being held in removable installations set up in the San Borja military complex in Lima, known as “el Pentagonito” (the little Pentagon).